South Wales millionaire and entrepreneur Kevin Green is to share the stage with Bill Clinton at a major UK business conference on Friday. Entrepreneurs 2012 is a four-day intensive business conference set to attract an audience of more than 10,000 at London’s ExCel arena. “It’s a massive event,” said Mr Green. 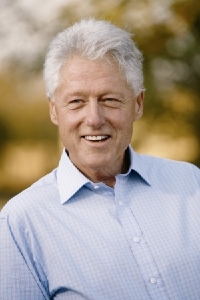 “And Bill Clinton has top billing as the main speaker in a star-studded line-up which also includes Ruby Wax, Bear Grylls, Kevin Spacey, Levi Roots, Carol Vorderman, Bruce Dickinson and Benedict Cumberbatch. “I’m very proud of the fact that I’ve been invited to speak on Friday, the big day when former United States President Bill Clinton will be speaking.